Now that you’ve mastered the world of electron configurations, it’s time to write orbital filling diagrams. This sounds like something that would be tough, but orbital filling diagrams are really just pictures that show you the same thing as electron configurations. Mostly. For the rest of you, here’s a picture of a woman eating a dog. Great! Now that you’ve done that, let’s get started! What’s an orbital filling diagram? If you remember to the last tutorial (the one you just read, remember? ), you’ll recall that electron configurations are big lists that tell you where the electrons in an atom are located. For example, the electron configuration for oxygen, 1s²2s²2p⁴, tells you that there are two electrons in the 1s orbital, two electrons in the 2s orbital, and four electrons in the 2p orbital. So far, so good. Orbital filling diagrams essentially just turn this big list of electron locations into a picture that shows not just what type of electrons an orbital resides in, but also which of those orbitals they’re located in. Don’t worry – this is easier than it seems. 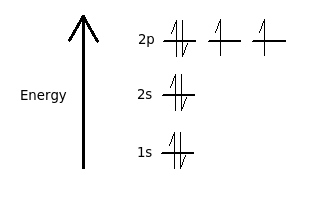 Electron configurations list the orbitals from lower to higher energy. For example, when I show you the electron configuration for oxygen (1s²2s²2p⁴), this means that the 1s orbital is lowest in energy, followed by the 2s orbital and 2p orbital, respectively. 1, 3, 5, 7. 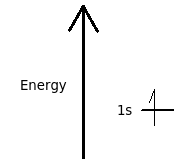 This is shorthand for the rule that energy levels hold one s-orbital, three p-orbitals, five d-orbitals, and seven s-orbitals. Every orbital can hold a maximum of two electrons. After this, they fill up and nothing else can fit. Electrons will tend to stay unpaired whenever they can, and double up only when there’s no alternative. This is called Hund’s rule, and we’ll talk about it in a bit. Armed with these rules, let’s get started! 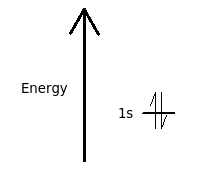 The vertical arrow on the left with the word “Energy” next to it will be in all orbital filling diagrams. All it does is tell the reader that as you move higher on the page, the orbitals will have more energy than the ones low on the page. In this example, there’s only one orbital, so it doesn’t really have much relevance. The line with “1s” written next to it represents the single 1s orbital that’s present. This diagram is exactly the same as the one for hydrogen, except that there’s a second arrow added to the 1s orbital. 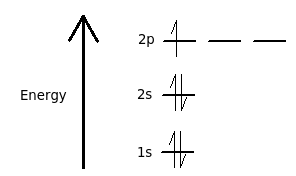 This represents the second electron in the 1s orbital, and is shown as “spin down” so you can tell it apart from the other one. Here’s the idea: The quantum numbers of an electron (hint: check the tutorial if you don’t know what this means) describe the properties of that electron. Because electrons all have negative charge, they have to be different in some way to keep them from repelling each other. This happens by giving them different quantum numbers, which results in different properties. And, as you may or may not have guessed, “spin” is one of those properties. Hence, we show the two electrons in an orbital as having different spins so they can coexist. For news about the other quantum numbers, you really should check the appropriate tutorial. Some students like to ask whether or not they can draw the first arrow down, or if it just has to be up. The answer: You can do it any way you’d like for a single electron, but if the orbital has two electrons one has to be up and the other down. The reason we show three p-orbitals is that p-orbitals come in groups of three. Even though two of them are completely empty, we show them anyway. 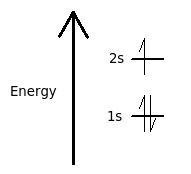 It’s standard to show the electrons as going from left-to-right and spin-up to spin-down. However, even though this is how it’s usually done, it’s not wrong to start by putting the electron as spin-down in the second orbital. It’s weird, but it’s not wrong. 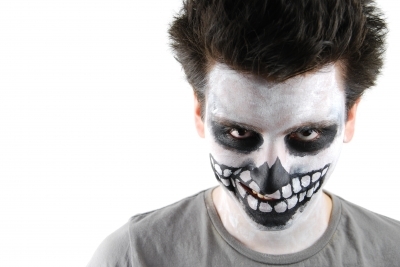 Creepy dude: Image courtesy of artur84 at FreeDigitalPhotos.netWhy, you may be asking yourself, are the two p-electrons shown in different orbitals? Isn’t it allowed to put them both in the same p-orbital, with one pointing up and one pointing down? Clearly I haven’t spent enough time practicing my photoshop. Hi! 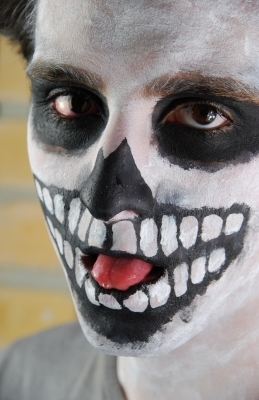 My name is Steve, and I’ll be your nightmare this evening. I’m definitely a photoshop pro! 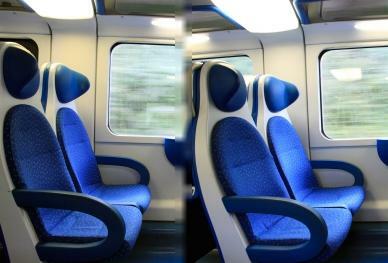 Now, where will you sit? You can either sit on the front pair of chairs, where you’ll get a seat all to yourself, or you can sit on the back pair of seats, where you’ll get to listen to Steve tell you about all the ICP shows he’s been to. …and that’s how I became the Hatchetman. Unless you’re completely nuts you’ll want to sit by yourself. 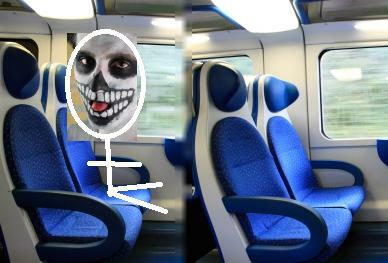 Even if the guy in one seat didn’t look like the product of a serial killer’s nightmare, you’ll probably still prefer to sit by yourself than next to him. This is because people just prefer to be apart from strangers. And that’s the basic idea behind orbital filling diagrams! And with that, you should officially know what you’re doing! We say electrons spin because they have magnetic properties that can be explained by their having angular momentum (i.e. they spin). Because electrons aren’t classical particles that spin but quantum particles that… uh… do quantum stuff, they don’t actually spin like little tops. However, the term stuck, so we talk about “spin up” and “spin down” for this reason.